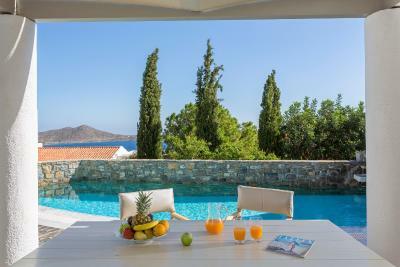 Lock in a great price for Elounda Gulf Villas – rated 8.6 by recent guests! 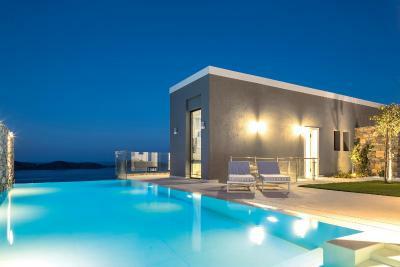 Luxury villas with top tier amenities. Great pool, good breakfast and lovely gardens. Helpful and friendly staff. Larg comfortable rooms. Amazing views from the room, friendly and helpful staff (arranging for in-house doc visit and purchase of medicine from local pharmacy was very much appreciated), good food with quality ingredients at the villa restaurants and well-cleaned and maintained rooms. The staff is wonderful. The suit is charming. Bed very comfortable. The hotel grounds are very nice. The entire property, service and staff were bar none the best that we have encountered. They went out of their way to ensure that we had the most amazing experience possible. 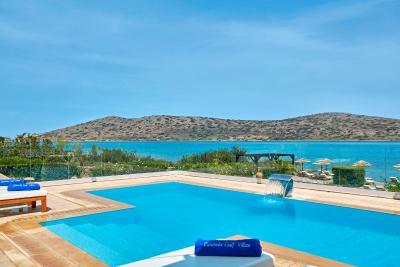 We will definitely be going back to the Elounda Gulf Suites as they treat you like family! Great staff and team who cater to your every need. Amazing kids club with clean and safe facilities that leave you kids wanting to go back each day. You really feel part of the hotel staff family during your stay. I liked everything! A great place i wld go back anytime! Het privé strandje lag op zeker 5 km afstand en niet op 250 meter zoals vermeldt op de website. Vervoer heen en weer is geregeld. De half board formule is geheel onduidelijk. Ontbijt op de kamer betekent de volle mep nog een keer , variërend van € 16,00 tot € 42,00 pp. Hetzelfde geldt voor het diner , de toeslagen slaan nergens op. 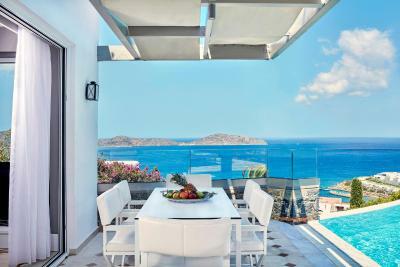 Elounda Gulf Villas This rating is a reflection of how the property compares to the industry standard when it comes to price, facilities and services available. It's based on a self-evaluation by the property. Use this rating to help choose your stay! One of our top picks in Elounda.Located just a short stroll from the sea in Elounda, the family-run property offers stylish villas with a private pool, and individually decorated luxury suites with Cretan Sea or garden views. Guests enjoy 2 a la carte restaurants. Each elegant suite features a DVD player, fully equipped kitchen with microwave and marble bathroom with hydromassage. They all boast access to the communal swimming pool. 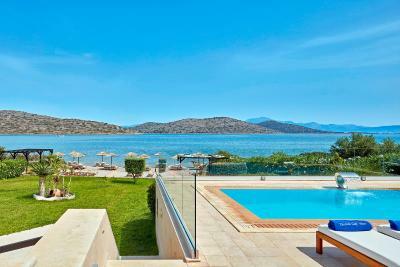 Elounda Gulf Villas have a spacious living room and hot tub. Breakfast is served daily at the main pool terrace. Drinks are served at the stylish bar. 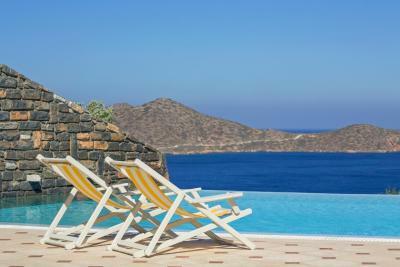 BBQ facilities can also be found in the premises of Elounda Gulf Villas. The property offers free transfer to a private Beach Club, located within a 10-minute drive, while complimentary transfer service to and from the beach is provided. 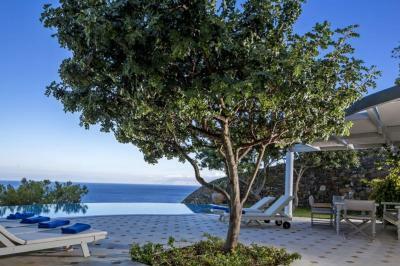 Services like massage in the privacy of the suite or in the Elixir Spa Gallery, and diving lessons in the main pool can be provided upon request. An Elixir Spa Gallery is provided for those who like to work out. Heraklion City is 43 mi away. The town of Agios Nikolaos is at a distance of approximately 6.2 mi. Free private parking is possible on site, and transfer from and to Heraklion Airport is offered. 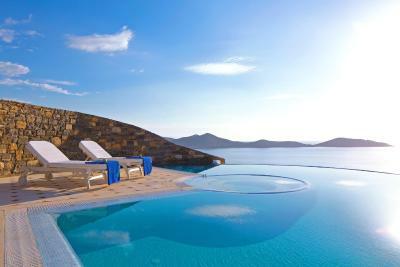 When would you like to stay at Elounda Gulf Villas? Luxurious suite with a separate living room. Guests enjoy complimentary use of the Elixir Spa Gallery. Please note that the price for single occupancy applies to one adult guest. In case that one adult and one child up to 12 years old will be in the room, then the price for double occupancy applies. Generously sized with 2 master bedrooms and private bathrooms, as well as sea-view balconies. Guests enjoy complimentary use of the Elixir Spa Gallery. 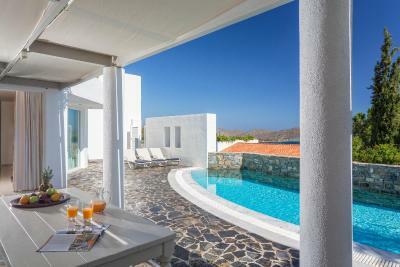 Two-bedroom villa with private bathrooms, a full kitchen and a private pool with a hot tub. Guests enjoy complimentary use of the Elixir Spa Gallery. Three-bedroom villa with private pool and hot tub. Individually decorated in warm and vibrant colors, this spacious villa has a full kitchen and a living room with floor-to-ceiling windows. A LED 3D 55'' Smart TV is available. The villa offers 1 master bedroom with private bathroom, fully equipped kitchen, a private gym room, sauna, steam bath, private pool with hot tub and a jet for swimming against the stream. A LED 3D 55'' Smart TV is available. Please note that from March 25 until June 02 and from September 30 until November 04 the pool is heated free of charge. The villa includes 3 master bedrooms with private bathrooms, living room, fully equipped kitchen, private gym room, sauna, steam bath, private pool with hot tub and jet for swimming against the stream. A LED 3D 55'' Smart TV is available. This very spacious villa features 4 master bedrooms with private bathrooms, spacious living room with floor-to-ceiling windows that capture the view and full kitchen. Includes private gym room, sauna, steam bath and private crescent-shaped infinity pool with 2 inbuilt hydro-massage bathtubs. 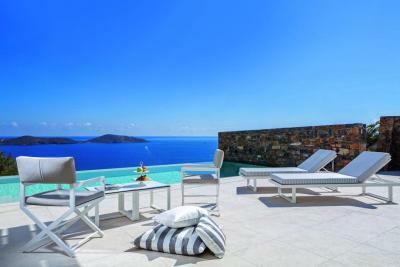 It has a private entrance, private parking for 2 cars and offers panoramic sea views. 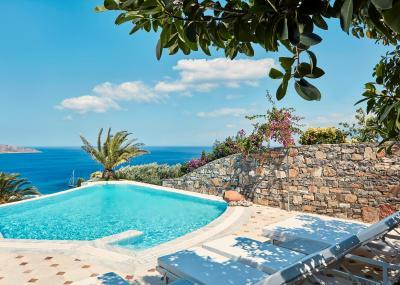 The sea-view villa consists of 2 master bedrooms with private bathrooms, living room, fully equipped kitchen, private gym room, sauna, steam bath, private pool with hot tub and jets for swimming against the stream. Featuring contemporary decoration, this split-level suite offers a spacious sitting area and bedroom in open-plan style. 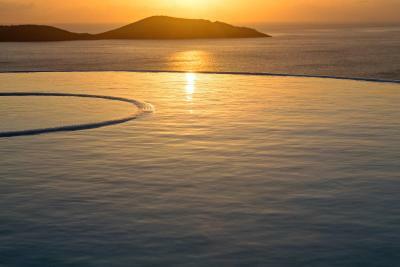 Offers private, seawater, infinity pool with hydro/air massage facilities and sun terrace with sun loungers. 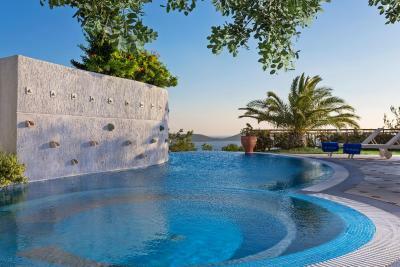 The private pool can be heated and offers a mechanism of night light with 36 different color combinations. 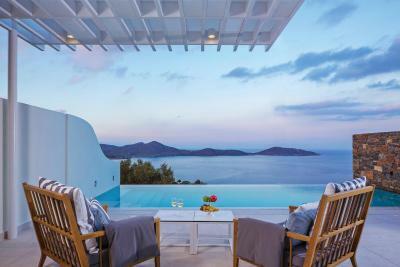 Guests enjoy sea view over the Gulf of Mirabello. The marble-lined bathroom provide a skylight. These suites are laid out in 2 levels and offer a private massage room and private steam bath. 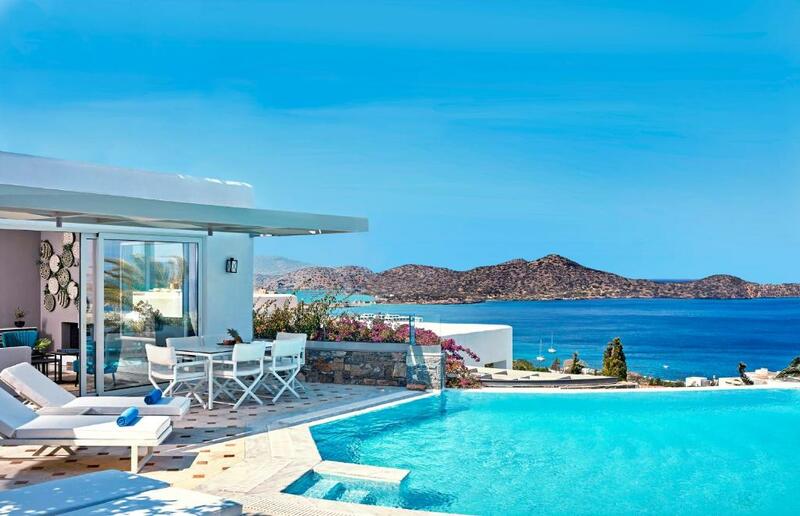 Located in the outskirts of Elounda and right on the beach, this 4-bedroom villa offers views over Spinalonga Island from its terrace. 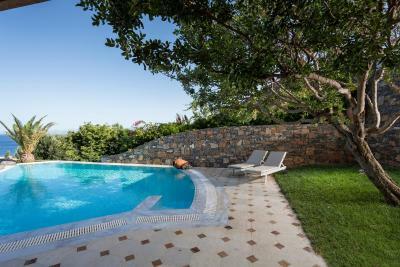 It includes a private swimming pool, 4 bedrooms and a garden. Enjoying panoramic views over Mirabello Gulf, this stylish suite features a seawater infinity pool with hydromassage facilities, marble-lined bathroom with skylight and open-plan bedroom. This split-level suite is equipped with a 55" Smart TV, espresso machine and a free handy smartphone for free international calls and free Internet mobile data. 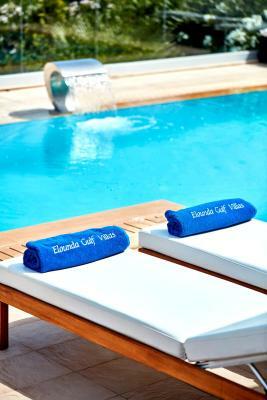 The cost for the pool heating is included in the rate for the Villas with private spa facilities i.e. 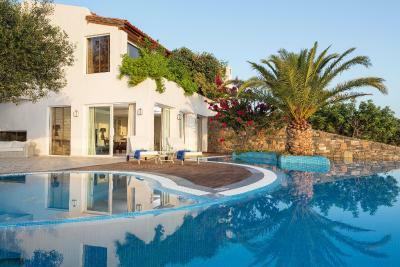 One Bedroom Villa with private pool and private spa facilities, Two Bedroom Villa with private pool and private spa facilities, Three Bedroom Villa with private pool and private spa facilities. 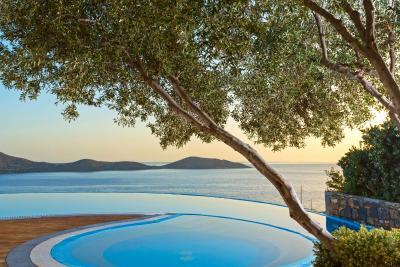 House Rules Elounda Gulf Villas takes special requests – add in the next step! 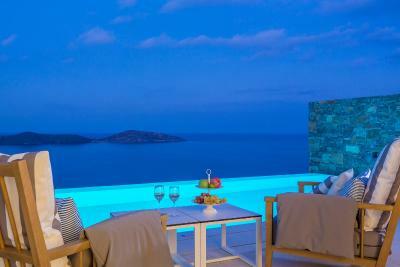 Elounda Gulf Villas accepts these cards and reserves the right to temporarily hold an amount prior to arrival. 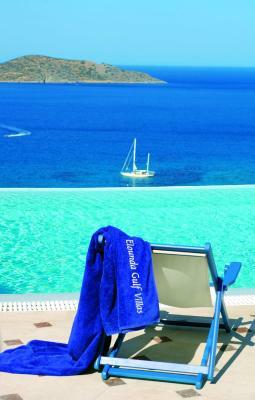 Please inform Elounda Gulf Villas of your expected arrival time in advance. You can use the Special Requests box when booking, or contact the property directly using the contact details in your confirmation. Have to improve beach club's food. Everything. Amazing staff. Quality is top level. The pruvate beach was tiny and quite far. It was an amazing experience for whole my family. Slow service at times (minor criticism). Wish it was located right on the beach, but the pool compensates and a private beach is available nearby. Very cold pool could do with a few solar panels at least. Drinks especially wine very expensive although exchange rate didnt help. Very comfortable bed. Outstanding staff. Like the staff, resort, restaurant. Pool was not heated:( Spiders !!! Whirl pool tubs did not work. Super staff. Beautiful property. Great food.